Passion rather than insouciance is Pires’s keynote. Here is an intensity and drama that scorn all complacent salon or drawing-room expectations. How she relishes Chopin’s central storms, creating a vivid and spectacular yet unhistrionic contrast with all surrounding serenity or ‘embalmed darkness’. The con fuoco of Op 15 No 1 erupts in a fine fury and in the first Nocturne, Op 9 No 1, Pires’s sharp observance of Chopin’s appassionato marking comes like a prophecy of the coda’s sudden blaze. Chopin, she informs us in no uncertain terms, was no sentimentalist. More intimately, in Op 15 No 3 (where the music’s wavering sense of irresolution led to the sobriquet ‘the Hamlet Nocturne’) Pires makes you hang on to every note in the coda’s curious, echoing chimes, and in the dolcissimo conclusion to No 8 (Op 27 No 2) there’s an unforgettable sense of ‘all passion spent’, of gradually ebbing emotion. Pires with her burning clarity has reinforced our sense of Chopin’s stature and created a new range of possibilities (showing us that there’s life after Rubinstein). Naturally, Rubinstein’s legendary cycles possess a graciousness, an ease and elegance reflecting, perhaps, a long-vanished Belle Epoque. Yet moving ahead, one has no hesitation in declaring Maria João Pires among the most eloquent master-musicians of our time. For Freire the Nocturnes are tirelessly experimental, an opalescent world of shifting moods and colours. Too serious to be overtly glamorous or heart-stopping, his warm-hearted performances eschew a concert-hall brio in favour of intimacy, almost as if played in the privacy of one’s own room. Not that he is immune to those sudden flashes of anger never far from Chopin’s always volatile nature. He is dramatically alive to the startling end to the Field-like B major Nocturne, Op 32 No 1, with its muffled timpani strokes and a sudden, chilling menace. The posthumous E minor Nocturne, too, which, as the booklet-notes usefully tell us, is a late rather than early work, emerges pained and drawn, reminding you of Delacroix’s celebrated portrait of Chopin. But overall Freire is at his finest in readings which are pensive and conciliatory. He is truly lento in the G minor Nocturne with its obsessive questioning and religioso conclusion, and time and again he makes you see these works as truly night pieces, music of an ‘embalmed darkness’ (to quote Keats). True, there are moments when a once legendary and impeccable technique stiffens (in the double-note flow of the G major Nocturne), yet this is less than marginal in music-making so personal and reflective. In his published conversations with Joseph Horowitz, Claudio Arrau startled his interviewer by claiming Chopin's greatest achievement to be the Nocturnes. In any event, Arrau's Nocturnes are likely the greatest achievement among his Chopin recordings. Why was Arrau so important in this music? Not to put too fine a point on it, he helped rescue Chopin from the pianists. On this 1977 recording there are no concert-hall roulades or frills - or lace, to use Arrau's own put-down of pianists who are nimbler of finger than of brain. He only offers the music - distilled and deeply pondered, and voiced and balanced with superhuman clarity. He is devastatingly honest without being showy. Tempi are slow enough for musical points to breathe: emotion is recollected in tranquillity, to borrow Wordsworth's definition of poetry. There's no falseness or smoothing-over of detail. It hardly matters that Arrau disrupts the lyricism of some pieces (Op 15 No 1). Sporting masterly control and a dark tone of infinite depth, he goes beyond lyricism to give every note its own inflection, its own colour. Joseph Horowitz points out Arrau's ability to play the Nocturnes' many ornaments as intrinsic parts of the melodic line. It's a kind of thorough textural organicism – to every note its place - that Beethoven or Schoenberg would have envied. And it's just the performance to show just how far the Nocturnes are from being mere character pieces – the slight, Romantic keyboard comfits that allowed the word 'bagatelle' to become a pejorative. As Schoenberg said of Webern's music, so one could say of Chopin's Nocturnes when Arrau plays them: 'a glance can be spun out into a poem, a sigh into a novel'. Here, in all their glory, are Rubinstein’s 1934-35 recordings of Chopin’s six mature Polonaises framed by examples of his early and late genius (Opp 22 and 61 respectively). Together with his early discs of the Mazurkas, Scherzos and Nocturnes, these performances remain classics of an unassailable calibre, their richness and character increased rather than diminished by the passage of time. For Schumann, the Polonaises were ‘cannons buried in flowers’ and whether epic or confiding, stark or florid, their national and personal fervour is realised to perfection by Rubinstein. Listen to the Andante spianato from Op 22 and you’ll hear a matchless cantabile, a tribute to a bel canto so often at the heart of Chopin’s elusive and heroic genius. Try the central meno mosso from the First Polonaise and witness an imaginative freedom that can make all possible rivals sound stiff and ungainly by comparison. The colours of the A major Polonaise are unfurled with a rare sense of its ceremonial nature, and the darker, indeed tragic, character of its sombre C minor companion is no less surely caught. The two ‘big’ Polonaises, Opp 44 and 53, are offered with a fearless bravura (you can almost hear the audience’s uproar after Rubinstein’s thunderous conclusion to the latter), rhythmic impetus and idiomatic command beyond criticism. This is Pollini in all his early glory, in expertly transferred performances. Shorn of all virtuoso compromise or indulgence, the majestic force of his command is indissolubly integrated with the seriousness of his heroic impulse. Rarely will you be compelled into such awareness of the underlying malaise beneath the outward and nationalist defiance of the Polonaises. The tension and menace at the start of No 2 are almost palpable, its storming and disconsolate continuation made a true mirror of Poland’s clouded history. The C minor Polonaise’s denouement, too, emerges with a chilling sense of finality, and Pollini’s way with the pounding audacity commencing at 3'00" in the epic F sharp minor Polonaise is like some ruthless prophecy of every percussive, anti-lyrical gesture to come. At 7'59" Chopin’s flame-throwing interjections are volcanic, and if there’s ample poetic delicacy and compensation (notably in the Polonaise-fantaisie, always among Chopin’s most profoundly speculative masterpieces), it’s the more elemental side of his genius, his ‘cannons’ rather than ‘flowers’ that are made to sear and haunt the memory. 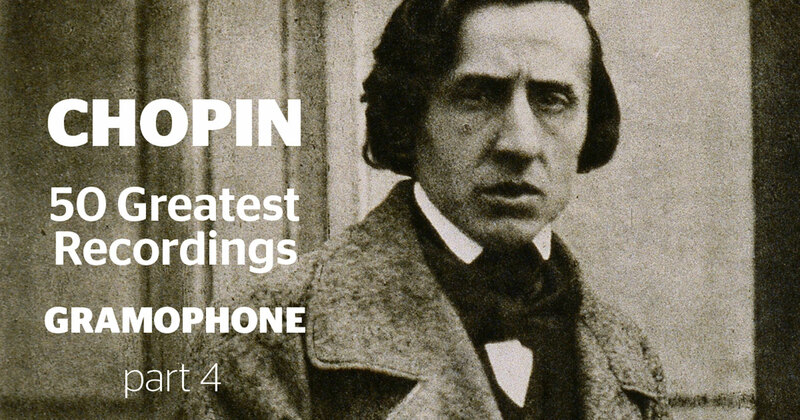 Other pianists may be more outwardly beguiling, but Pollini’s magnificently unsettling Chopin can be as imperious and unarguable as any on record. That his performances are also deeply moving is a tribute to his unique status. Jerzy Żurawlew, the founder of the Chopin Competition in Warsaw, was once asked which one of the prize-winners he would pick as having been his favourite. The answer came back immediately: Martha Argerich. This disc could explain why. There are very few recordings of the 24 Preludes that have such a perfect combination of temperamental virtuosity and compelling artistic insight. Argerich has the technical equipment to do whatever she wishes with the music. Whether it’s in the haunting, dark melancholy of No 2 in A minor or the lightning turmoil of No 16 in B flat minor, she’s profoundly impressive. It’s these sharp changes of mood that make her performance scintillatingly unpredictable. In the Barcarolle there’s no relaxed base on which the melodies of the right hand are constructed, as is conventional, but more the piece emerges as a stormy odyssey through life, with moments of visionary awareness. Argerich is on firmer ground in the Polonaise, where her power and technical security reign triumphant. The CD ends with a rippling and yet slightly aggressive reading of the Second Scherzo. This is very much the playing of a pianist who lives in the ‘fast lane’ of life. The sound quality is a bit reverberant, an effect heightened by the fact that Argerich has a tendency to overpedal. Good news for pianophiles everywhere that Grigory Sokolov has, as DG put it, now signed an exclusive contract. This is of course not taking him into the studio or anything as workaday as that. No, he has allowed them to release a live recital from the 2008 Salzburg Festival. But let’s not knock that: it’s difficult to imagine just how much negotiation that must have taken. Comparisons are irrelevant (except perhaps with himself): this is Sokolov we’re talking about. But in this cult of celebrity, his very aversion to the notion has turned him into one – a bit like Glenn Gould in an earlier era. Of course, all of this would be beside the point if he didn’t produce the goods. It’s an overused word, but he is inimitable. His Chopin Preludes, for example, have no time for the notion of a freely Romantic melodic line being kept in check by a Classical accompaniment. Sokolov’s reading as a whole is remarkably consistent with that of his live 1990 recital released on Opus 111. In both, he begins unhurriedly, as if the music were gently rousing itself into life. But whereas in less imaginative hands the results could seem mannered or overly drawn out, here it’s mesmerising. In the Sixth Prelude, for instance, the upward curling arpeggio has a rare poignancy, while the Tenth glistens but also has an unexpected hesitancy about it. In No 13, the glorious melody of the middle section is given with a freedom that would simply not work in a lesser musician; while in the infamous ‘Raindrop’, Sokolov replaces the constant dripping with a shifting pulse that has a real urgency, albeit an unconventional one. No 19 is a particular highlight, its delicacy quite heart-stopping. He ends as he began, with a tempo for No 24 that has gravitas (not to be confused with heaviness), the effect granitic, magisterial. The Mozart is treasurable too, though – of course – you have to take it on its own terms. What he does with the slow movement of K280, for instance, gives it a kind of operatic reach and breadth, though never does it lapse into histrionics. And in the finale he brings out the main theme’s stuttering quality superbly, lending the music not just a mercurial quality but a dramatic one too. His delight in the chewy harmonies of the opening movement of K332 is palpable, his phrasing iridescent in its range. The Salzburg audience (who are generally reasonably silent except for the tumultuous applause) were lucky enough to get six encores. The Scriabin Poèmes are more than usually clear descendants of Chopin in Sokolov’s hands and the filigree is out of this world. By contrast, Rameau’s Les Sauvages is unexpectedly playful and whimsical, and we end with a clear-sighted Bach chorale prelude that is all the more moving for its apparent simplicity. As Sokolov says in the booklet: ‘I play only what I want to play at the current moment.’ Perhaps that’s what gives this set such integrity. Listening to his impressive new recording, it’s easy to understand why Cristian Budu won the Clara Haskil Competition in Vevey three years ago this September. A Brazilian of Romanian descent who studied at the University of São Paulo and the New England Conservatory, Budu is a stunningly original pianist with musical insight and maturity that could inspire envy in colleagues twice his age. He has the sort of hands that used to be called ‘velvet paws’, which are seemingly incapable of making an ugly sound at the instrument. Online videos show him to be strictly business. No demonstrations of how almost to fall off the bench, no stomping the floor, no challenging Lon Chaney for the title ‘Man of a Thousand Faces’. Completely relaxed but with an almost scary intensity of focus, Budu’s every motion is directed towards the production of sound. All this comes through loud and clear via the strictly audio medium of the CD, captured with remarkable nuance by the Claves engineers. For his debut recording, Budu chooses an entire disc of miniatures. He is able to focus attention on the tiniest details while leaving proportions perfectly intact. Eloquent phrasing is ever front and centre, and no expressive potential is left unexplored. He commands an immense colour palette and moves from a robust fortissimo to a scarcely audible pianissimo in a nanosecond. It’s a credit to the subtlety of Budu’s musicianship to say that his Op 33 Beethoven Bagatelles could easily be transferred to an 1804 Streicher with barely an adjustment of the touch he uses on the modern Steinway. Scrupulously observant of the composer’s agogic indications, the abundant drolleries of these pieces are understated and all the wittier for it. My favourite is the C major (No 5), which scurries about with amazingly precise urgency. When all the coruscating bustle finally runs up against a solid wall, Budu resists violent assault, the default choice of most pianists. Instead, he recovers from his bewilderment and, to great comic effect, seems to fashion a door, and calmly walk through. Were his Chopin Preludes not so delicately coloured, their visual equivalent might be leafing through a portfolio of Ingres’s finest graphite portraits, marvelling at their succinct precision and lifelike directness. At once their striking individuality embraces a sweep and cohesion that leave the impression that the entire set could have been captured in a single take. The A minor (No 2) demonstrates Budu’s ability to create a heart-gripping pianissimo, whispered and just barely audible. In the G major (No 3), the right hand floats spacious and serene over the bubbling cascade of left-hand figuration. The A major (No 7) is a genuine Mazurka in microcosm, while the tolling bells of the E major (No 9) seem to grow and grow without ever exceeding the bounds of an exquisitely beautiful sound. When things grow desperate, depicting fight or flight, as in Nos 12, 16, 18 or 22, the dramatic tension is breathtaking. Recently it seems as if the tap were left running and we’re suddenly knee-deep in Chopin Preludes. Of those I’ve heard, including the sets by Goerner, Cho, Yundi and Sokolov, Budu’s are the most enduringly satisfying. Bolstered by a vital and intelligent Beethoven, they strongly suggest that Cristian Budu is an artist we’ll be eager to hear more of – the sooner the better. Love him or hate him, Pogorelich guarantees a response. Chopin for the faint-hearted this isn’t; original, provocative, challenging, daring, it emphatically is. Nevertheless, if Pogorelich’s most unconventional ideas approach wilful eccentricity, the rewards far outweigh any reservations. True, if they weren’t reinforced by such transcendent pianism Pogorelich’s interpretations wouldn’t carry nearly the same authority or conviction; but it’s precisely the marrying of his imaginative scope with his extraordinary technical resource that opens up such startling expressive possibilities. The First and Second Scherzos show the juxtaposition of extremes at its most intense, stretching the limits of the musically viable. Predictably, the outer sections of the B minor Scherzo are incredibly fast, possessed of an almost demonic drive, while the central Polish carol (‘Sleep little Jesus’) is unusually slow and luxuriously sustained. But such extremes, of character as much as tempo, place enormous -tension on the musical structure, and this is most evident in the B flat minor Scherzo. Make no mistake, Pogorelich’s playing is astounding, from the imperious opening to the lingering and ravishing middle -section, where his sublime lyrical simplicity is of the deepest inward poetry. To sum up, a recording like this isn’t easy. Some may find Pogorelich’s probing individualism too overwhelming. There are more ideas crammed into under 42 minutes than on many discs almost twice the length, although most collectors will still feel short-changed by the playing time. This may not be Chopin for every day, but the force of Pogorelich’s musical personality subtly and irrevocably shapes one’s view of the music. A truly extraordinary disc.